Choosing the best blender for smoothies can get tricky. You want something that’s not going to take up a lot of space or break your budget. Furthermore, it needs to be powerful enough to chop hard ice and some vegetable varieties. Smoothies make a perfect snack, meal replacement and no-fuss source of quick nourishment. Popular for a quick breakfast, smoothies are a great source of nutrition as you can add in a variety of fruits and vegetables. However, before you go out and buy the ingredients, make sure that you have the right equipment to make a perfect, healthy smoothie. The choice depends on your personal preference. It is the perfect device to get if you have a small kitchen. However, bear in mind that it is not as powerful as other blenders on the market. The smoothie would probably have some leftover lumps. This is the kind you mostly see in the infomercials. It is a favorite because of the convenience of use. You can only make about two cups of smoothie at a time, and it is quite easy to clean. If you are looking for a device that will enable you to make all sorts of blended concoctions in your kitchen, then choose a professional one. It is the only one that will give you the smoothest results, and you can also use it for other recipes as well. 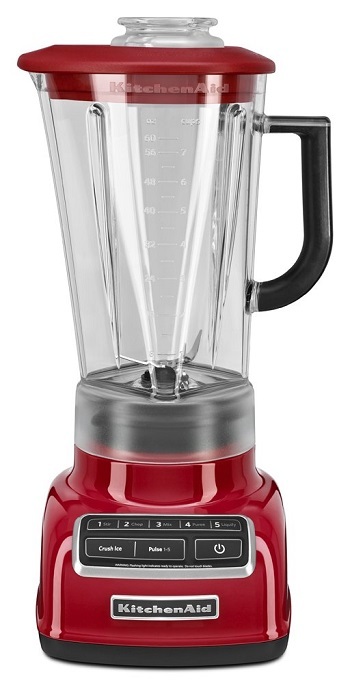 Vitamix is known as one of the premiere brands of household blenders and the 5200 series model is a great example of its reputation. This versatile blender was designed to become the universal tool of your kitchen and is able to make almost any recipe in your kitchen, even hot soups. 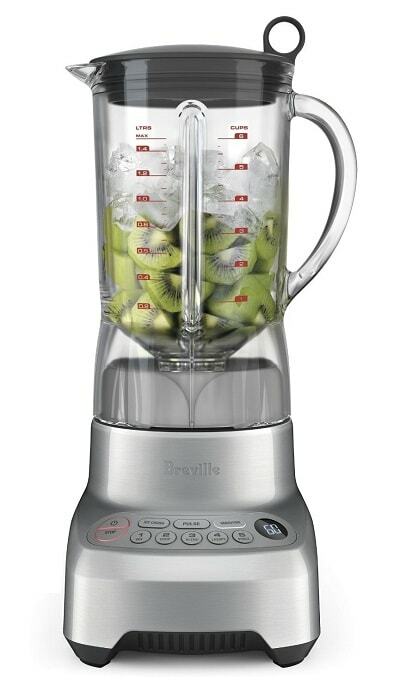 However, we also love it because it’s the best blender for green smoothies! It comes with a 64-ounce container, which means you make multiple servings on the go. This is a great feature if you have a large family. The Vitamix 5200 was designed to beautifully blend pretty much any ingredient, from hard ice to small seeds. The speed knob offers a variety of speeds that will make sure to give you any texture you desire. The Vitamix 5200 series model 3-inch cutting blades promise to crush every ice cube, pulverize every chia seed and puree every piece of fruit. These cutting blades are made of stainless steel and are guaranteed to get the job done the first time. Made completely in the United States, Vitamix is so sure that you will be satisfied with this model that they offer a full 7-year warranty. Combine all of this into one machine, and you have the best smoothie blender on the market. • Is designed with irremovable blades. When blending thick foods, you will have a problem getting it all out. Kitchenaid is another trusted appliance brand that is known for their high-quality products. The Ktichenaid 5-speed diamond blender delivers a quality blending experience with this appliance. Kitchenaid offers much more customization than other brands by offering more than 20 color options to make sure you are blending in style. This model is more than just looks and offers a 60 ounce BPA-free pitcher to hold all of your ingredients. The stainless steel blades have been designed to create a vortex to create the desired texture. This technology is called the diamond blending system and is responsible for quality blending every time. Besides pulsing, pureeing and blending, the Kitchenaid 5-speed diamond also offers a crush ice mode for the perfect smoothie consistency. Never again will you have to worry about chunks of lingering ice in your smoothie. This blender features intelli-speed motor control technology, which ensures the optimal speed to blend ingredients together no matter what. The Kitchenaid 5-speed diamond also comes with a 1-year replacement warranty. This series of high-end blenders were designed to combine functionality with a sleek design. The Blendtec desiner series have been called the “Swiss Army knife” of blenders because it is able to do it all. The Blendtec designer series sleek design isn’t just for looks. The flat sealed design allows for quick and easy cleaning. The pitcher is dishwasher-safe as well. All Blendtec products come with an 8-year full replacement warranty, which is one of the best in the industry. The Breville Hemisphere control was designed to create the perfect velvety smoothie. 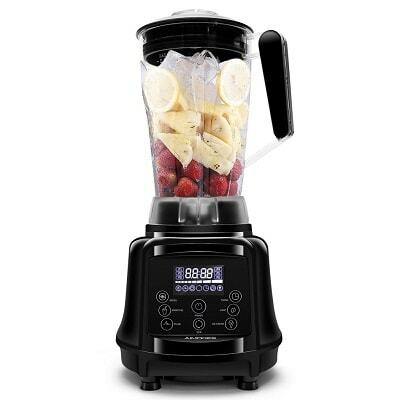 This model features a number of pre-programmed settings, many specifically created for making smoothies. The unique blade system is what sets the Breville Hemisphere control apart from other models. With central blades that chop and crush and bowl hugging blades that aerate and whip, this model promises consistent blending results. The Breville Hemisphere Control also offers an LCD timer, 48-ounce jug pitcher and sleek design. In fact, the contoured bowl design helps make cleanup a breeze by preventing food particles from getting trapped in hard to reach areas. Another great quality of this model is that it is extremely quiet due to the efficient motor system. Perfect for making those early morning breakfast smoothies! Here’s another Vitamix model that makes our list for the best smoothie blender. 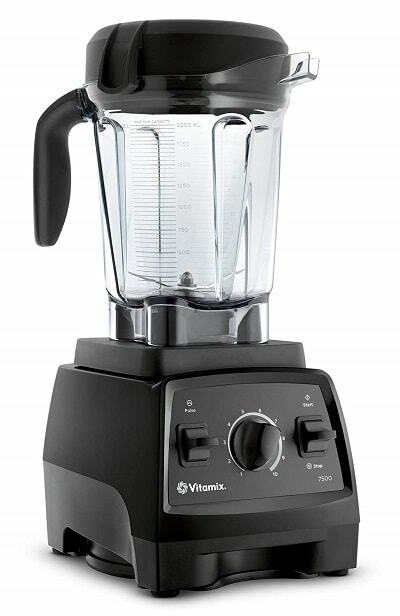 The Vitamix 7500 is the most powerful blender on the list and features a 2.2 horsepower motor. With ten different speeds, it promises the perfect texture and blend every time. The pulse feature is one of the most unique. It allows for the user to layer chopping with pureeing for those making more complex recipes. However, the simple blend option will work just fine for making a smoothie. 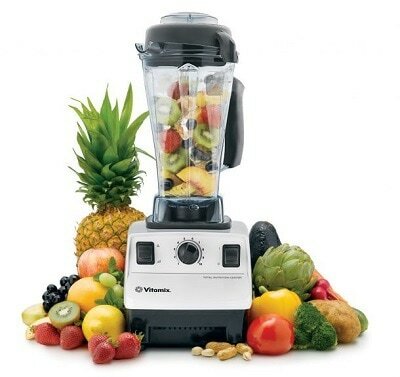 The Vitamix 7500 comes with a 64 ounce container and laser-cut stainless steel 4 inch blades. The machine also features a 6 foot cord to allow you to move it easily around the kitchen with ease. As all Vitamix products, the 7500 is made in America and comes with a 7 year warranty. Overall it’s the best blender when stacked up against any other model or manufacture. The Oster Versa Pro Performance runs on a powerful 1400 watt motor. Its motor speed can be adjusted to suit your preferences. Making use of this function can help improve the quality of your blend and prevent the overheating of your device. This product comes with three programmed settings. These can help increase the accuracy of your preparations. Included here are smoothie, soup, and dips/spreads. The consistency of the preparation can also be controlled quite easily using the pulse button provided. Because of these functions, the blender can be used for many different purposes. 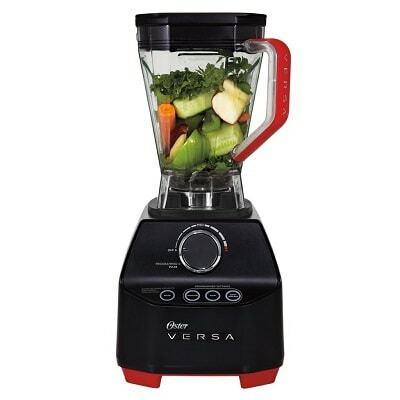 It can even be used to blend nuts, crush ice and even make soups. The manufacturer also offers a 7-year warranty. Oster brand is old and established in the industry, so they can be relied upon to produce high-quality products. As many users have noted, the design is quite sturdy and can run optimally for a long period. The drive is actually made of all metal instead of plastic, and this increases the life of the product considerably. Your purchase will include two cookbooks that detail popular recipes. 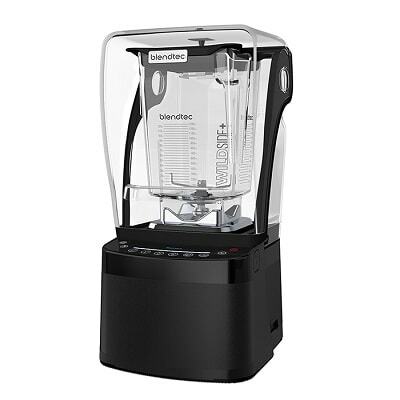 The Blendtec Pro 800 is powerful, quiet, and highly functional. It has preset programs that can automate your blending process and shuts off when the ingredients are completely blended. This means you can simply load your items, push the start button, and then carry on with your regular schedule. The machine will even control the speed settings for you. It will increase and reduce the speed to make sure all the ingredients are prepared perfectly. It has a large and sturdy base. Its design appears durable, which is why the company offers a 10-year warranty on all purchases. The biggest disadvantage is its high price. However, many users find it fair since the machine gives you great value for your money. 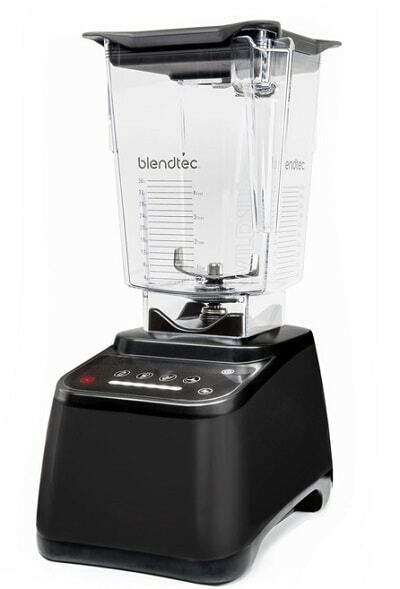 In addition to the functional convenience offered, the Blendtec Pro is very easy to clean. The entire cleaning process involves loading the machine with water and holding the pulse button for a few seconds. The Blendtec Pro 800 is also very quiet. If you live in an apartment or with other people, it will reduce the noise irritation greatly. • Controls and settings are slightly difficult to understand based on some customers. 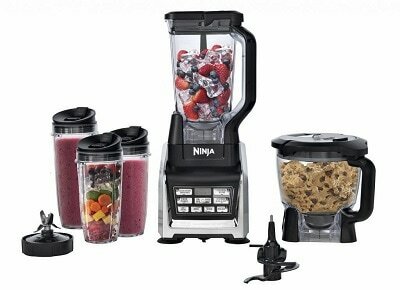 The Ninja Kitchen System with IQ Boost is designed to make drinks fast and precisely, and is, therefore, best suited for people who usually don’t have much time to spare. The preparation simply involves pushing a button. It also includes Total Crushing Technology to help in the crushing of items such as ice. As a result, you can make perfect frozen smoothies! The IQ Boost functionality is important since it helps reduce the guesswork involved in blending. Without your actual involvement, the blender knows when to stop so as not to mess up your drinks. Alternatively, you can control it manually using the “on” button. This same switch can be pressed to stop the device. It also has a pulse button that can be pressed and held when you want it to run. The timer will let you know how long the machine has been preparing your drink and the actual duration of the pulse. You can use this information to stop the device and to release the pulse button. The machine will shut down automatically when it gets too hot. This prevents damage. 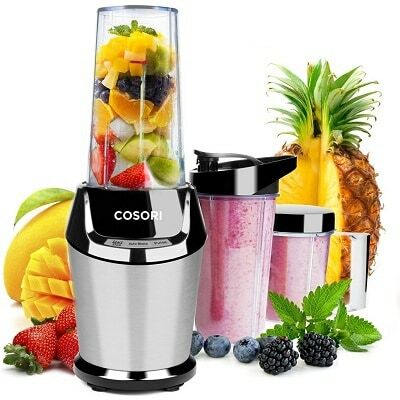 If you are looking to invest in a powerful and efficient blender, then the Cosori Professional might be the right brand for you. This device comes in nine parts. You get a blender, as well as a blade attachment, a storage lid, and a travel lid. In the set, there are also two 32 oz and one 24 oz container. If you are new to the smoothing world, then you will be happy to know that Cosori also throws in a recipe book as well. Inside, you will find everything you need to know to get you started. After all, a good blender is of no use if you do not have healthy recipes. Just like any product, this one also comes with a user manual that will help you understand the multiple functions. What makes Cosori stand out is the practical design. There are three control buttons in total. A start/stop button controls the blender, while the other two decide how you want it to blend your smoothie. Furthermore, this device is easy to clean and convenient to use every day. Because it comes with multiple parts, it means that almost everything is detachable. Therefore, you will not have an issue while cleaning it. You can wash the cups in the dishwasher, and the rest is easily done by hand. This is a powerful machine to have in your kitchen. The 800 watts motor easily chops and blends all kinds of vegetables, fruits, nuts – even ice. In addition to that, the blades are sharp and efficient, and it’s also extremely quiet. The device is FDA certified, and it is also BPA free, so you can rest assured knowing that nothing about it can hurt you. • Sturdy enough to take everyday use, and it is extremely quiet. • It will not move around – there are suction cups at the bottom, so you will not have to hold it in place. • The auto blend feature allows you to get a smooth consistency every time you use it. • The containers are just not the right size. Either they are too small or too large. That is a problem if you are making the smoothie only for yourself. • Occasional lumps when blending frozen fruit or harder food. • The quality of it might not be the greatest on the market. • After a few uses, the plastic inside might melt or break. If you love devices that can do almost everything you need in the kitchen, then this Aimores Professional might be your new best friend. When you buy it, you also get a recipe book, a manual and a brush for cleaning. There is also a blade dismounting spanner, and regular warranty and warning cards you get in almost every package. The color selection is a bit limited – you can get it in dark or light black color. However, the design is stylish enough for any kitchen out there. Not everything is about looks, though. The best part about it is the construction. It is a high-speed device that will quickly turn anything you put inside into a smooth liquid or paste. The blades are fantastic for crushing ice, pureeing vegetables, blending smoothies or processing other foods. You can make soups and dips, sticky dough, and even cake batter. But, more importantly – smoothies will be completely pulverized. It is ETL and FDA approved, and also BPA free. The manufacturer did not use any harmful materials to make it, and all the parts it comes with are easy to clean and maintain. Speaking of parts, a wonderful thing about this smoothie is the extra large pitcher. Made of unbreakable tritan, you can make 75 oz of anything inside it. Furthermore, it has a few neat features, like the auto shut off. It will stop working as soon as you take the pitcher, so there is no chance of accidentally breaking it. • Powerful 28000 RPM motor for the price. • The 1100 watts can crush and blend almost everything. • You can wash some of the smaller parts in the dishwasher, and the pitcher is easy to clean by hand. • The pitcher is so big that you can easily make enough smoothies for 3 to 4 people in one go. • You cannot remove the jar blade and clean it, so it might rust after a while if you are not careful. • It is heavier than most models, and you need enough room to store it in the kitchen. Choosing the best smoothie doesn’t have to be too complicated. Opt for the most powerful one that you can easily clean, and you won’t have any trouble making healthy recipes every day. Before buying a blender, make sure you have enough space to store. You want to make sure you have enough counter space, or cabinet space depending on where you want to keep it. Choose a powerful blender that’s simple to use. For instance, does it have presets? Are the controls easy to follow? You should look for blenders that are easy to clean and have removable parts. A bonus will be if the blender is dishwasher friendly. This is probably the most important aspect of a when you’re considering to buy. A weak motor = poor blending results. We recommend a motor that’s at least 800 watts or more. If you’re on a budget, or if you really just want something strictly for making smoothies, the Breville, Kitchenaid, Aimores, or Oster VERSA are great options. If you’re looking for a combo/all-in-one package type deal, the Ninja Kitchen System or COSORI are great choices. They also come with blender bottles so you can easily take your smoothies to go! If you’re looking to make great smoothies, and basically anything else you can possibly think of, both the Vitamix 5200 and 7500 models, or the Blendtec Designer Series are great investments. If you’re looking from professional quality, and if money is no option, the Blendtec Pro 800 is your best bet.